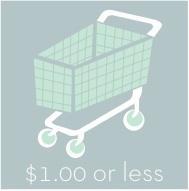 Here is this week’s list of everything under $1. We haven’t seen this long a list in a while so check it out and see if there is anything you want for less than a buck! Crest Whitening or Pro-Health Toothpaste, 5.8-6.2 oz, $1.67 ea. Old Spice or Secret Deodorant, 99¢ ea. Chef Boyardee Pasta, 7.2-7.5 oz cup or 14.5-15 oz can, $1 ea. Save 10¢ per gallon WYB (3) participating items.